As a designer I often wonder how much of a difference I can truly make in the lives of others, truth be told, it probably isn’t that much, but that is why I am completely in awe of amazing minds that develop remarkable ways in which ordinary individuals can contribute to the greater good in a small but significant way. 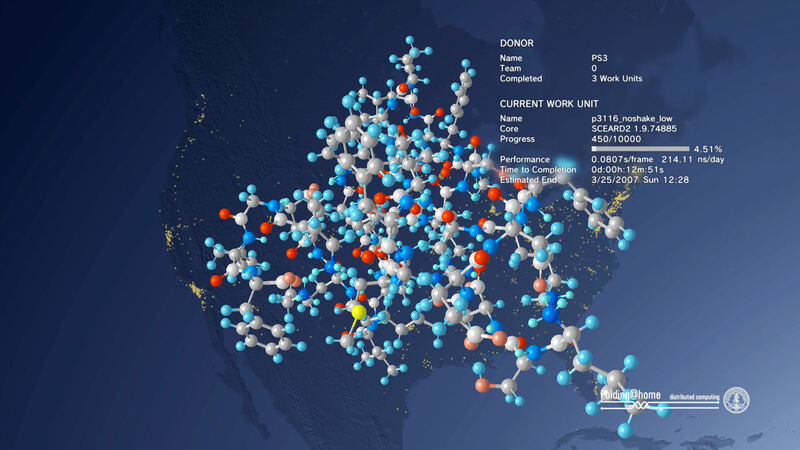 Folding@home is a distributed computing project for disease research that simulates protein folding, computational drug design, and other types of molecular dynamics. The project, founded by the Pande Lab at Stanford University, uses the idle processing power of thousands of personal computers owned by volunteers who have installed the software on their systems. Each person “lends” his or her idle computing time for the purpose of determining the mechanisms of protein folding, which is the process by which proteins reach their final three-dimensional structure, and to examine the causes of protein misfolding. A protein before and after folding. It starts in an unstable random coil state and finishes in its native state conformation. What does this mean in a nutshell? With the power of thousands of computers the scientists at Stanford are then able to gather the medical research they need to provide treatments and cures for diseases like Alzheimer’s, Huntington’s disease, and many forms of cancer, among others. Commercial partners of the project include: Intel, Google, Nvidia, ATI and Playstation, who recently ended their Life with Playstation programme. This is a visualisation of the Folding@Home protein simulation on “Playstation’s Life with Playstation”. So when at the end of the day, when you walk away from your computer, having had enough of work, simply connect to this amazing project and let it do the rest. To install Folding@Home and contribute the global network of computers click here to download the program.